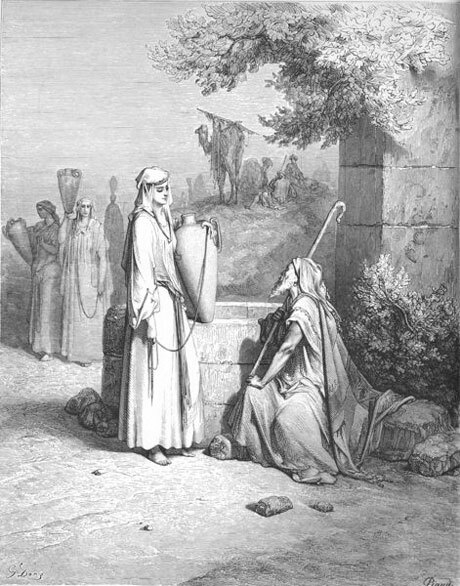 Rebekah and Eliezer at the Well 1866. Public Domain. Abraham sends a trusted servant to find a wife for Isaac. Psalm 45: 10-17 or Psalm 72 (UMH 795). See a musical arrangement for Psalm 72. Psalm 45, as provided in the Revised Common Lectionary (the UMH Psalter is based on the earlier Common Lectionary) may fit the reading a bit better. Also consider singing "Out of the Ivory Palaces" (Worship & Song, 3076), which is based in part on Psalm 45. Paul reckons with the power of sin at work in his body. Jesus reflects on the resistance of the people to John and himself, prays to God, and invites the heavy laden to come to him. Church Calendar: Ordinary Time continues with a weekly celebration of life in the power of the risen Christ. Civic Calendar: Independence Day (US) is tomorrow. If you plan to recognize that celebration in worship today, see UMBOW 442 and these online resources: "A Great Thanksgiving for Independence Day" "Call to Worship for Independence Day" and "Worship and Music Resources for USA Independence Day." Denominational Calendar; The next denominational emphasis is Hispanic Heritage Month, September 15-October 15. The next denominational special Sunday is World Communion Sunday, October 2. In preparation for World Communion Sunday, consider viewing "Living into the Mystery," either in worship or as part of a class. You can view it online if you have broadband Internet; or order the DVD. The video and ordering details are available here. Consciousness of Contexts: In the Southern Hemisphere, this is winter. Except for the hardier winter crops, the fields are fallow. In the tropics, days are warm as ever. Further south, there may be snow or rain. Colombia, Ecuador, and Venezuela, for whom we pray this day in the ecumenical cycle of prayer, as with a number of the nations for whom we have prayed in the past several weeks, are all in the Southern Hemisphere. Phillip Jenkins reminds us in his now classic book, The Next Christendom, that already the balance of Christian faith has shifted from the Northern Hemisphere to the Global South, with over half of all Christians living in Asia, Africa and Latin America. By 2050, he projects, European heritage non-Hispanics may make up just one fifth of the total number of Christians on the planet, which he places, conservatively, at three billion. Some missiologists are also predicting that given current growth trends, by 2050 the nation with the highest population of Christians on the planet may be China. What does that have to do with United Methodist congregations in the U.S.? We see similar trends in our church as well. At the 2008 General Conference, nearly 28 percent of the delegates seated were from the Global South (Africa and the Philippines). In 2012, this percentage will be closer to 34 percent and will approach 50 percent by 2020. That is how fast the churches in those regions are growing numerically compared with the rapid decline in the U.S. and the relative stability in Europe and Eurasia. United Methodists are part of a global church in a global Christianity that is changing its geographic and cultural center southward (not US South!). All of these people, wherever they live, are our sisters and brothers in Christ. How will you help people in your congregation, regardless of its local ethnic or national makeup, find meaningful connection with the whole body of Christ in worship and in other ways with what the Spirit is doing across the global church? God's promise to make of Abraham and Sarah a blessed people required more direct heirs and more generations than one. For their offspring to become a people, Isaac would need to be married and have children of his own. That is the story we hear this week. And it is a story primarily told through an "outsider." We see it unfold through the eyes of a servant (perhaps Eliezer the Syrian). Abraham sent this servant to bring find in an "interim" homeland (in southeast Turkey; his family had originally been from Iraq) the right woman (someone of his household), arrange the marriage, and bring her back for Isaac to receive as wife. This unique perspective may be the point of this story, not only narratively (after all, the aged and well-off Abraham is not going to do this himself), but also theologically. This next phase of God's promise unfolds through the faithfulness not so much of the one calling the shots (Abraham), but of a trusted servant and kinfolk hundreds of miles away. God's story and promise is embedded in the interactions of all these people across all these cultures. Perhaps most importantly, that promise now depended on the decisions and discernment of the two who had the least power, but had been given the most trust by all involved the unnamed servant and Rebekah. Where does your worshiping community find itself in this story? Where do some people in your worshiping community find themselves in this story? Are you or some of your worshiping community Abraham, entrusting the hopes for the continuation of God's promise to another? Are you or some of them the trusted servant, trusting God and skillfully navigating the negotiations that will help that promise come to fruition? Are you or some of them Rebekah, suddenly finding yourself invited to be part of a story you didn't know could be opened to you? Or are you or they Laban, invited to make a bargain that may seem like sending a sibling far away? Put another way, is your congregation or are some in it releasing control, actively negotiating, being invited to consider a new future, or entering into some sort of exchange in which you may lose one thing to gain another? Now a third level where is your community not just where your building is located, but the networks of relationships you have as individuals and a congregation in this story? Given where you are as a congregation, where your people are, and where you discern your community is, how might this story encourage you to understand the kind of role or roles you may have in continuing to embody God's promise, God's kingdom, where you are? But don't stop there. Remember that the response of every person in this story involved a new commitment. Abraham had to commit to ensuring the line would continue through his family and to sending a servant with clear boundaries but no micromanaging instructions to take care of that. The servant had to commit to fulfill Abraham's commission and to trust that God would indeed help that happen. Laban had to commit to allowing his sister to join the journey his uncle Abraham had embarked on many years, several cultures, and hundreds of miles ago. And Rebekah had to commit; indeed, she was given final say and freedom to choose to take up the role of matriarch in an extended branch of the family and with a husband she had never met in a land far away. As you design worship for today with your worship planning team, if the answers about where your congregation and community fit in this story are not clear, or if what you really need to do is to ask more questions, then start asking them! Talk to people, use Facebook and Twitter and whatever you have at your disposal to get the conversation going. Draw images from stories that you are aware of from the congregation or community that might be indicators of one role or another, but focus the sermon and response to the word on helping folks discern their own predominant place (individually), where the congregation and community seem to be, and then what that might mean for them. Choose music and other elements in worship that support a spirit of discernment, openness to and awareness of what God has already provided in your midst as you listen for God's call. What images, soundscapes, words in songs or prayed in Psalms (don't limit yourself to Psalm 45, especially if the role you find yourself in is not that of Rebekah!) will help to support an atmosphere conducive to helping folks where you are make the commitments God is calling them to make today? Romans may seem to take us to a very different place from what we saw last. In Romans 6, Paul's admonition might be summarized as, "Look, you're baptized. That means sin and death are conquered for you in Christ. Live like that!" Here, however, he seems to be almost wallowing in what seems like excuses for not being able to overcome sin in his own life! What gives? What gives is sanctification (Romans 6:19). Christ has conquered sin and death, period. Beginning at baptism, we are given power to experience freedom from sin and death as we serve righteousness and live without fear in the face of the powers that threaten. Those are the realities we come to know, as Paul puts it here, in our "inmost beings" (7:22) where we do now, in fact, "delight in the law of God." The trouble is most of our actual life experience who we have been and the habits we have formed does NOT know these realities. We have to learn them, become rewired or repurposed by them, and continually reminded of what God is now making us in Christ's victory through the Spirit. Down to our neurons, we've been patterned in ways we're not even aware of to respond almost if not entirely automatically in particular ways to particular situations. In this process of sanctification we're being invited to experience now in Christ and with one another, all those responses, down to our neurons, are now being repatterned. (Though Paul wouldn't have talked about neurons, what he is describing in this week's reading reflects much the same phenomenon action that seems to occur against or without our conscious assent). Actively remembering who we are in ritual and in a variety of moments in intentional practices such as prayer and Bible study is only one part of the work of sanctification. We do have to do more than decide, either once or at intervals, to live out our baptism. The transformation we all need to overcome "the law of sin at work in our members" is substantial. We cannot hope to do that ourselves alone. Accountable small groups can and will help, especially if they function as genuine community for us rather than one more meeting to attend in an otherwise occupied schedule. But ultimately, it is the victory of Christ that has started us on the path of sanctification, and it is Jesus Christ who will lead us through. "Thanks be to God who gives us the victory through our Lord Jesus Christ!" (Romans 7:25a). This text is confessional both of our actual condition (still patterned for sin) and of our real hope for sanctification made possible by Christ. As you plan worship around this text, think about images, soundscapes, and songs that help the people of your particular congregation to get in touch with the ways they're still patterned for sin, with their struggle with the reality of their automatic responses. If you have the appropriate licenses or subscriptions, consider using clips from the movie Liar, Liar, where the character is forced to say exactly what he thinks always against his own will or judgment, or the "training programs" in The Matrix. Help folks get in touch with their ongoing struggle with sin, but don't leave them there, caught in the struggle and without hope. Invite people to share stories of ways they've experienced victory over sin and death in their lives as Christ has, in fact, repatterned them. If you don't know of people in your congregation who would offer such a testimony, ask others if they know of someone in another congregation. Often, folks who have been part of a recovery process (such as AA, NA, or Gamblers Anonymous) have a story to tell not only about how Christ has broken the substance or process abuse, but has actually transformed the way they think and behave. Consider reading all of Matthew 11:16-30 (including verses 20-24). Worship planners: If you are focusing on the gospel today, be sure to support this text with images, stories, song, and/or movie clips in ways that stay true to how challenging these words are and that do not side-step the issues at stake or soft-pedal the exclusive claims of Jesus here. Last week we heard the amazing things that happened when Jesus sent his disciples into mission and they went. This week we hear his reflections on those who responded negatively or not at all. Jesus' words here are anything but calm or generous. It is not "okay" with Jesus that people do not respond to the proclamation of God's kingdom. He portrays it a sign of the depths of the blindness and self-occupation common to the ways of the world and too many people in it. Jesus describes those who reject the message in several ways. In verses 16-17, they are like children playing "wedding" or "funeral" and complaining that other children don't play the game they're playing when they're playing it. "This generation" is simply playing life, and they're so focused on playing what they want when they want that they can't see or respond to real Life when it's right in front of them. John came fasting, and they rejected him as a demoniac. Jesus came rejoicing, and they call him a glutton and a drunkard and a partier with sinners. Jesus has no kind words to say about self-absorbed folks playing life and condemning others for not playing their game. Instead, he reveals it for what it is. He names their resistance and rejection in a way that shows just how foolish, how childish, it is. Are there processes of resistance like this where you are, in your congregation, community, or the larger world, that need to be lifted into the light in a similar way? Work with your worship planning team to name what these may be, and then to determine which of these may most accurately name what is happening where you are, and how to communicate that effectively this Sunday in response to this text. The omitted verses (20-24) are even starker. Jesus is not all right with people and places that have seen the signs of God's kingdom but have refused to change their lives. He reproaches the cities of Chorazin and Bethsaida, saying their response was worse than that of Tyre and Sidon, Israel's ancient and perhaps most "pagan" rival. And Jesus reproaches Capernaum, his base of operations in Galilee, telling them they're headed for Hades and a fate worse than Sodom's. This text is no warrant for a rant today. It is a reminder, however, that reproach is part of Jesus' response, as it had been part of the response of the prophets before him and since. Reproach of cultures that reject God's kingdom may not be "nice" or "politically correct;" but it is here, literally, the word of our Lord, even the gospel of our Lord. How do people where you are hear reproach? Do they hear the condemnation only, or do they also hear the grief and the hope for change that accompanies it? Are some ready to throw back reproaches? Might others be shouting, "Preach it!" How do you respond? Are you ready to throw back reproaches? If so, what does that say about your own defensiveness? What are you holding on to that keeps you from surrendering yourself fully to God's kingdom? Are you shouting, "Preach it?" If so, is this only because of the hope of the kingdom stirring in you, or are you also (or even primarily) out simply to attack others while ignoring the log in your own eye? Perhaps another response a truly open heart might offer is "Yes, Lord" or even, "Lord, have mercy." It is essential that we hear and reflect on how clear, how harsh, and how divisive Jesus' speech in these verses is if we're going to hear the "verses we like" (28-30) in their fullness. And before we get there, we have one more difficult gauntlet to pass through (verses 25-27). Jesus offers a prayer (25-26) in rather a different tone, followed by a brief, but stark declaration (27) that sounds more like John's gospel (John 14:6, to be precise) than the synoptics, as a capstone to the denunciations he has just made and a segue to the invitation that follows. The prayer: "I acknowledge you with gratitude, Father, Lord of heaven and earth, because you have hidden these things from the wise and the intelligent and have revealed them to the smallest of children. Ah yes, Father, for that's what was pleasing in your sight." The prayer is bold. Jesus addresses God not only as Father, but in the second person singular, familiar (thou). The prayer is almost an interjection, and perhaps almost a laugh. It embraces the kinds of reversals Jesus has announced time and again were part of God's kingdom, almost in a parody of Jonah's declaration at the end of that book, "I knew you were like this, God!" The declaration: "All things have been handed over to me by my Father. No one gets to know the Son except the Father, and no one knows the Father except the son and anyone to whom the Son chooses to reveal him." There is a level of exclusivity of knowledge and relationship here that is not to be ignored. Jesus is declaring himself here to be the pivot point of history, the lens through which to "get to know" God and all things. Miss him and his teaching, and you do not know God or anything else worth knowing. Be blessed to have the Son reveal the Father to you, and then, but only then, you have right understanding. Note that the choice for the Son to reveal the Father to us is not ours to make. We do not get to decide who Father is, nor do we get to decide on what we want to believe about the Son. The Son reveals the Father to those whom the Son decides. The "verses we like" (28-30) are perhaps the verses at which those of us in the "First World" may most need to take pause. These verses disclose those to whom the Son decides to reveal himself: the worn-out and the overburdened. That's probably not most of those attending our congregations or being "good citizens" in the U.S. or Europe, or nearly anywhere in the developed world. Jesus offers hope here to those worn down by the way the world works (with shots called by the powers that be) and who end up carrying the brunt of responsibility, burden, and often blame for things they have little capacity to do anything about. These are the slaves, the poor, the people who live at the margins of "respectable" society, who constantly have to jury-rig their way through each day because the systems for survival and thriving that others can easily access are not designed to work for them. Indeed, those systems seem to be designed to keep them marginalized, worn-out, and overburdened. Now look carefully what Jesus offers these people. "Come to me, and I will give you rest" is the usual translation. "I will refresh you" is another. The verb here most literally means "stop again," or something like "press the pause button." The Sabbath is the necessary period at the end of a week. We can't just keep going. We all need the full stop. The worn-down and overburdened need it even more. They rarely get it. But Jesus promises them exactly that. The refreshment Jesus offers is not "inner peace" or even a "get-away." What he offers here is instead his teaching. "Take my yoke on you, learn from me. My heart is meek. I understand poverty. Learn from me, and your souls will have refreshment. My teaching does not keep you worn out. My teaching does not add to your overburdened life." Indeed, from the previous chapters in Matthew, we know it does not. God's kingdom has drawn near, and it is for the poor. Jesus has just healed folks too poor to see a physician. Demoniacs were, or quickly became, among the poor; and Jesus set them free from their possession. The lepers lived in isolated, abject poverty; and Jesus cleansed them, allowing them to enjoy the riches of community again. Nobody else in the mainstream (First World) did these things, but Jesus did and does. (See, "There's no one in this world like Jesus," Worship & Song, 3036). Too many people, too many children to this day die for one reason only: poverty sustained by systems that enrich others. Jesus conquers death and raises the dead. This is the One to whom the Father has revealed himself. And this is what he has decided to reveal to the world, as preserved in these Scriptures. "Come to me, ye that are weary and heavy laden" are not "comfortable words" for the First World. Jesus is not here calling us who have not repented by dismantling systems that keep the poor poor and the marginalized marginalized to a big "bear hug" from him. He does not invite us to feel good about ourselves while, by our actions, we continue to ignore or reject his teaching. He denounces our rejection. The promise of refreshment is for those who take his yoke upon them and learn from him those who have been rejected and those who will walk his way. (See "We Walk His Way," Worship & Song, 3073). This is good news for the poor and a gauntlet thrown down to the rest of us. The smugness and self-centered feel-goodism of the First World needs to be confronted today. But it needs to be confronted not only with its own falsehood and emptiness, but with more living signs of God's kingdom and the truth Jesus reveals happening in your midst. Or of not in your midst yet then somewhere! Who in your congregation or community is hearing and responding to the good news that following the way of Jesus brings real rest to the worn out and overburdened? Who has taken up the gauntlet and joined the work of God's kingdom to dismantle the systems that keep the poor poor not just to buy a net to help one family stave off malaria (as good a thing as that is to do), but actually to be part of ending the conditions of extreme poverty that make malaria such a disaster the ninth leading cause of death in the world in the first place? Throughout July, we will offer forms of intercessions based on each of the Scriptures for each week. These may be led by a deacon, or in the absence of a deacon, by a lay leader or lay speaker. With all our hearts, and all our minds, we pray to you, O God. For your church throughout the world, and especially for sisters and brothers in Ecuador, Columbia, and Venezuela, that we may live your promise where we are, and continue to build friendships and partnerships far away. For the leaders of nations, especially the leaders of our own nation, that they may govern their peoples with justice, and seek the common welfare of all peoples. For the earth you have given us to cherish and protect, that we may use its resources wisely and, like Rebekah, offer its resources to kin and stranger. For the sick, and all who care for them; prisoners, and all who suffer; the poor and the strangers, and all who ask our help. For all who will be born this day and all who will die; for all who rejoice in new life and all who mourn; for all who begin new journeys, and all who face an end. Hear us, O God, and in your compassion receive our prayers for these and all we now name, silently or aloud. Jesus, Victor over Sin and Death, Judge of all, mercifully hear our prayers for all who need your help. Thanks to you, O God, through Jesus Christ our Lord! Amen. speak wisdom through the smallest of children until we hear your truth and obey! Let us pray for wisdom for the church, its members, its leaders, and its mission. Silence or spoken prayers, all at once. Or sing Worship & Song, 3094, "Come to Me," or 3135, "In God Alone." reproach us, Jesus, and remind us your kingdom is for the powerless and the poor. Let us pray for courage for the leaders of the nations, including our own nation, and the peoples of Ecuador, Columbia, and Venezuela. drive us to active compassion for all survivors and a determination to do our part to reduce human contributions to such disasters. Let us pray for the earth, and for all who have power to make decisions that can make life safer for all on this planet. heal and deliver the sick, release the captives, and bring recovery of sight to the blind, by your power and by the wisdom, skill and will you have given us. Let us pray for all who are sick, oppressed, or suffering. move us to remove all burdens from those we have overburdened, and to provide true rest for those we have worn out. You have revealed your Father to us, Jesus. in Spirit and in Truth. Amen. Background: Not long after Abraham buried Sarah, he sent his chief servant Eliezer (introduced in Genesis 15:2), back to his kinsmen to select a wife for Isaac. On the way to accomplish the task, like Gideon and his fleece (Judges 6:36-40), the servant prayed for a specific way to recognize the one who should be Isaac's wife -- the young woman who would offer to water his camels after he asked for a drink of water (Genesis 24:12-14). Almost on cue, Rebekah appeared with a water jar; the servant asked for a drink of water; and Rebekah offered to water his camels! The servant secured lodging with her family for the night after he learned that he had stumbled upon Abraham's kinsmen. The ring for Rebekah's nose and the bracelets (Genesis 24:47) may be assumed to signal interest in marriage. Rebekah's presence at Sarah's tent, though Sarah was dead, signaled that she would be the new matriarch. Notice the mention of love and comfort in the last verse. Theirs would not be an arranged marriage devoid of love. Read the entire chapter for a more complete description of the selection of Isaac's wife. Visit www.textweek.com for a wealth of additional online resources for this text. The Gospel reading for this Sunday contains two distinct passages with differing ideas. Think of choosing either verses 1619 or verses 2530 for your sermon. Matthew 11:1619: Indictment. Jesus' use of the phrase "this generation" is prophetic speech compare to Deuteronomy 1:35). His statements are an indictment against the "groupthink" of the people who heard both his and John's message but remained unchanged. Jesus compared the people of Israel to spoiled, bored children who refused to play according to the rules. When the flute was played, the children were supposed to play wedding; and when the wailing was heard, they were supposed to play funeral. The two extremes represented the extremes of John's and Jesus' ministries. John led the lifestyle of an Old Testament prophet. He was a Nazirite, meaning that he did not indulge in strong drink, and he did not eat with people considered unclean. Yet, the people of that generation rejected his message -- too tough! John's followers were thought to be too ascetic (Luke 7:33-34) -- they would not mourn with them. Jesus, by contrast, embraced everyone and ate and drank with everyone; and he was called a glutton and a drunkard. His message was also rejected -- too soft! Jesus' followers were accused of not being sober enough (Matthew 9:14-17 and synoptic parallels of this passage) -- they would not dance with them. Matthew 11:25-30: Thanksgiving and Invitation. Thanksgiving. Jesus publicly gave thanks to God that some, considered by the so-called wise and intelligent to be more like infants in their faith or understanding, would be able to hear and receive God's message. Invitation. Let the weary and the burdened come to Jesus for rest. The term "yoke of the law" was familiar to the hearers. The yoke or burden of the Pharisees was more than the people could bear (Matthew 23:4). Jesus' invitation was not to unbridled freedom, but rather to experience rest by accepting the yoke of Christ. Who Goes to Sarah's Tent? This passage reminds us of several things that contribute to stability and continuity: religious practices and shared values, marriage and courtship rituals, and the way that some people function in the community. Sarah obviously had a function in her small community. In the extended household of wandering Abraham, the part that Sarah played was needed for their sense of continuity and well-being. After Sarah's death, there was no one to function as Sarah once did. Isaac immediately brought Rebekah to Sarah's tent to signal one of Rebekah's new roles in their extended household. Think of the importance of certain functions for the successful operation of other groups to which you may belong. We recognize the importance of parliamentarians, historians, researchers, wisdom-keepers, and even gatekeepers. The contributions of these and others with specific roles help a group maintain its focus and balance. In the last fifty years we have made tremendous changes in the way that we regard gender roles in culture -- including church culture. Right now, gender roles in postmodern culture are fluid, especially in the church; yet men continue to be reluctant to assume roles that women normally take. Women continue to experience difficulty in either seeing themselves in certain roles or in receiving permission from the community to assume new roles. We have done a great deal of work to ensure that both women and men have the right to choose what they do. But, I wonder, in the midst of this change, if we have given enough attention to making sure that we mentor both men and women for the roles and functions that we need for stability and continuity. How does your local faith community function as a group? What is already present, and what is needed to ensure the continuity and stability of your faith community? Do you have adequate mentoring systems and discipleship systems in place for the future of the church and the local faith community? Which group functions are needed to keep it focused and to equip it to be an effective witness in your community? Who speaks a word of wisdom when it is needed? Who calls the group to task when it wanders off course? This week's passage is challenging: Are we preparing enough people, both male and female, for our future leadership needs? As we continue to navigate through the choppy waters of this fluid time, whom will we take to Sarah's tent? Who, male or female, will take her place in the community and do what she once did to keep our community stable? The Old Testament and gospel reading for this Sunday is part of the semicontinuous track of readings for the long period known as ordinary time. Have you considered the rich texts from Genesis and Exodus for a summer series? See the article on this subject for considerations for the period from June 19, 2011, to Christ the King Sunday in November. There is still time to work on a sermon series for the summer using the texts from the Revised Common Lectionary as a starting point. For examples July 10, 17, 24 deal with parables about seeds and potential and hidden things. A miniseries on our life together could flow from reading the texts together. July 31 and August 7 deal with the feeding of the 5,000, which was a miracle of provision that begs for a stewardship miniseries. If your series begs for additional texts and additional weeks, don't resist the winds of the Holy Spirit! For more on series opportunities after Pentecost, read "Getting on the Right Track". You Can't Please Everybody! I wonder if Jesus has a word for those of us who are on a relentless quest to find consensus. John the Baptist approached Israel with an ascetic lifestyle and hard to hear preaching. Jesus approached Israel with a gospel of peace and reconciliation and acceptance. Israel preferred neither. If even Jesus and John the Baptist had a difficult time reaching Israel with two very different approaches, is there any hope for us? Some days, we may have to proceed with what we believe to be God's wisdom and let the chips fall where they may! Josephus, Antiquities of the Jews, Volume I; see Chapter 16 "How Isaac took Rebekah to Wife"